The most important and widespread building type in ancient Greece was the temple. The first stone temples appeared some time during the early 6th century BC and began to appear in large numbers in the next century. The purpose of a Greek temple was usually to house a cult statue or emblem. Religion did not require people to gather inside the temple to worship, and their temples were primarily monuments to the gods. The most recognizable feature of the Greek temple are the massive columns. 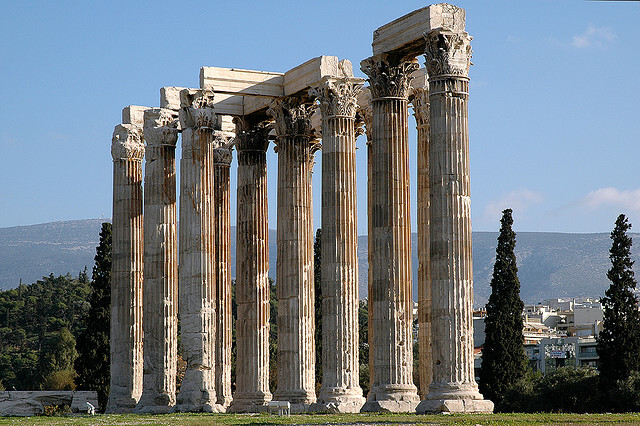 The Greeks used three types of columns: the Doric, Ionic and Corinthian order.